This is a research project to document people from the village of Marlesford, Suffolk, England, during the First World War. The First World War started on the 4th August 1914 and despite the belief that it would '...all be over by Christmas', war raged in Europe and across the world for 4 years until the later part of 1918, it will be remembered as the bloodiest war of modern history. The year 2014 marks 100 years since the start of the war and many events and memorials are being held in 2014 and over the next 4 years to mark this world changing event. We have strong family connections with the village of Marlesford, as we are descended from George and Yvonne Hicks who owned, 'Church View' which was the left hand side part of the property now known as Meadow Cottage in the 1960's and 70's (until 1976). George and Yvonne are commemorated in the graveyard at the church. Their daughter Yvette Angeline Tyrrell (my mother) is also commemorated in the same area of the churchyard. We now have children of our own, George and Thomas who we hope to give an understanding of the Great War and the village. See 'About Us' for more. 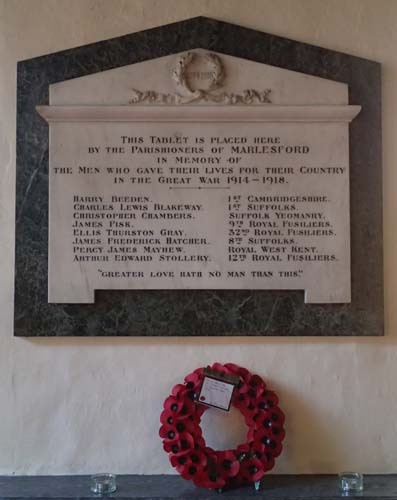 The initial focus will be those men who made the ultimate sacrifice and commemorated on the Church War Memorial but we hope to expand to include the stories of those who returned or maintained village life during the war. Provide a place where descendants of the men, people from the village and we, can document information about people from the village during the Great War, not just those that fell but also those on the Roll of Honour and any other villagers. One of the reasons why the Great War holds such fascination for many is that it introduced the tools of modern warfare in the guise of submarines, aeroplanes, tanks, chemical weapons and machine guns, which were pitched against young men whose leaders were making decisions and applying tactics from a different and distant era. The challenge that faced military leaders was to adapt quickly to the new tools of war. However changing the tried and tested manoeuvers of hundreds of years proved too difficult and this failure to adapt to the changing theatre of war resulted in a muddy and bloody stalemate with opposing sides scrapping over bomb scarred, putrid strips of mud where thousands of men on both sides lost their lives in senseless massacres. Looking back from the 21st Century the concept of trench warfare is incredible. To have two sides stand a hundred metres from each other taking pot shots and charging towards machine gun fire, only to be mowed down in simple carnage, is incomprehensible. This coupled with the horrors of gas and chemical attacks, which blinded and burned men's lungs and throats; massive mines and bombs that shredded bodies apart and buried people alive, the mud that sucked men down and drowned them slowly and the battles that lasted a day but saw the slaughter of tens of thousands of soldiers, all add to the interest and fascination of the Great War. It was a conflict of its time; the war may not have been so prolonged or so devastating if it had started either ten years earlier or ten years later. But at this one moment in time the technological advances in the means of killing, outstripped of all other progress in the important aspects of warfare. Notably, if the same advances in the means of communication had been made as in the means of killing, hundreds of thousands of deaths may have been averted. It leaves us wondering what stopped military and political leaders looking objectively at the complete lack of progress, with the same fields, towns and hills being won and lost and fought over time and time again, and why they didn't say '...stop, there must be another way'. The slaughter of hundreds of thousands of people, each with their own individual story and journey of their war, across the world, and the greater impact on families and friends meant that nobody went untouched by the Great War, sadness spread across the world. We should never forget the incredible sacrifice made by so many despite the passage of time, this is why we want our children to understand the Great War and why this project is important to us. If you have stories you would like to share we would love to hear from you. And please return again in the coming months to see how the site is growing. 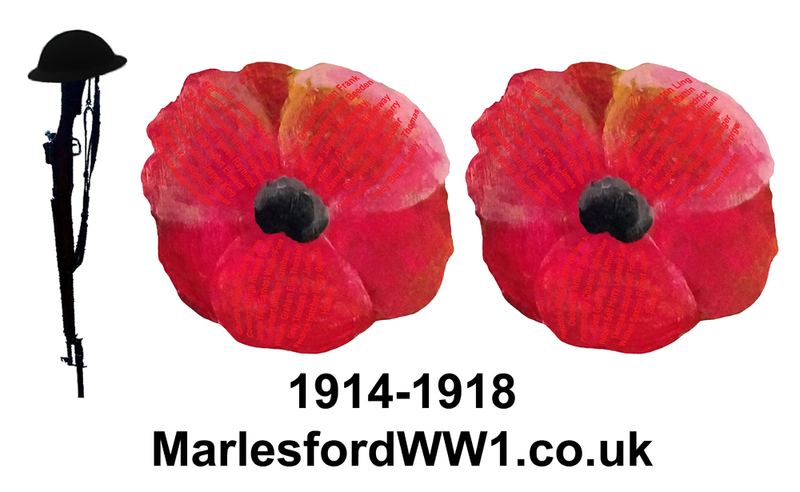 For updates on the site or research or just as another means of contacting us, please see the Marlesfordww1 Facebook page.